What is the best way to get in the Holiday Spirit in South Florida? We do not have fireplaces and snow to give us the holiday season "feel" but we do have Holiday Boat Parades! All over Florida boat owners decorate their boats of all sizes in holiday lights and drive down the intracoastal waterways for everyone to view! Gather friends and family and attend one of the fun Holiday Boat Parades in your area. 1. Jupiter Boat Parade December 5, 2015 6:00 pm. The waterside events are along Jupiter Riverwalk and is hosting FREE viewing event, including food, music and festivities. You can also view from Sawfish Bay Park and Lighthouse Park. Bring your own chair and an unwrapped toy to the Events Plaza for Toys For Tots collection location. 2. Boynton Boat Parade December 11, 2015 5:30 pm. 44th Annual Holiday Boat Parade begins at the Lantana Bridge and can be viewed at the Boynton Harbour Marina, Intracoastal Park to the C-15 Canal in Delray. This is a toys For Tots collection location. 3. 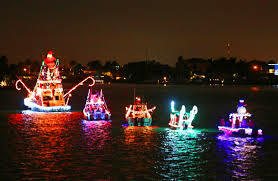 Boca Raton Boat Parade December 19, 2015 6:30 pm. 39th Annual Holiday Boat Parade will start at C-15 Canal and travel south to the Hillsboro Bridge. 4. Lantana Boat Parade December 18, 2015 6:00pm. 1st annual Boat Parade will be on Lake Osborne and begins at the Anchor Inn heads east side lake around Paul mar Dr back to Kingston Dr and loop back North along east side shoreline (Highridge Road) to Lantana Bridge to Lakeworth road boat ramp and ends back at Anchor Inn.